Southeast, east and southwest windows. Nineteenth century glass. View taken towards east from foyer. East window, 1820 view with original glass. View from the foyer into the chapter house showing the east window with all its original glass as of 1820. R. Cattermole, del. Etched by J. LeKeux. Published by J. Britton, 1841. Now for the most part lost, heraldic devices originally formed a band around the chapter house in the other windows. Detail of the above view. West nave windows have some original chapter house glass. Note the row of seven heraldic shields at bottom of three great lancets, moved from chapter house and repositioned here. Detail, surviving chapter house heraldic devices, west windows. Detail, heraldic device from chapter house. Arms of Gilbert de Clare, Earl of Gloucester (1262-1295). Arms of Eleanor of Provence, wife of Henry III (d.1290). Arms of Louis IX of France, brother-in-law of Henry III (1226-1270). Arms of Richard, Earl of Cornwall, brother of Henry III (1225-1272). Arms of Roger Bigod, Earl of Norfolk and Earl Marshall (1225-1270). Window in the nave, south aisle, bay 20. With some surviving glass from the chapter house repositioned in right lancet. With some surviving glass from chapter house repositioned in right lancet. Detail, chapter house glass at top of right lancet. A bishop and a king in architectural surround from an oculus in the heading of the chapter house window tracery, an angel from a quatrefoil in the tracery, two bishops from a spandrel in the tracery. Detail, two clerics, right lancet. Detail, bishop and king, right lancet. Window in nave, south aisle, bay 22. Some surviving chapter house glass in window over the doorway in the west wall. Detail, figures at top of lancets. Figures of demi-angels from the chapter house, now inserted in the lancets. Window in nave, north aisle, bay 22. Window over doorway in the west wall, bay 22. Detail, figures from chapter house inserted in lancets. Windows in southeast transept, south wall. 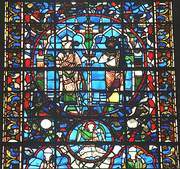 Three large lancet windows contain grisaille glass some of which was formerly in the chapter house. Lancet windows over dean's door in north choir aisle, bay 6. Some of the grisaille glass may have been formerly in the chapter house. Chapter house window tracery, view from exterior. Detail, tracery, view from interior. Detail of the tracery showing the somewhat restored heads on the cusps of the octafoil. Detail, tracery and 19th century glass. Detail of the chapter house tracery showing the nineteenth-century figures of a king and a bishop in architectural surrounds occupying the oculus and the figure of a bishop in the spandrel below. Nineteenth-century glass in a chapter house window showing the demi-figure of an angel in a quatrefoil surmounting two of the lancets filled with grisaille glass.